Wunderlist promises to keep your life in sync. It certainly helped us do so! Learn how to be more productive by this highly functional to do & task tool, that helps you stay on top of things at work and at home. Recommended to us by no other than Jo Fairly, founder of Green & Black chocolates. Having a to do list that is easily reachable and fast processing is crucial as, otherwise, you will give up using it. Wunderlist is overall easy to navigate and not confusing in structure or appearance. You can quickly add a list and just as rapidly create a file to add lists in. One of its other main characteristics is its simple prioritisation system through which you can mark high priority items with stars which will then be available at one glance, in a separate list. You can then add these into an additional list, as you can have multiple lists going on at the same time. Collaborative lists are great when working on big project as overlaps may always occur. Joint lists can be great for exchanging feedback as it is possible for different people to add comments, notes and attachments. The shared to-do lists can used to quickly assign tasks or to add subtasks for your team members, while they can also be shared via Email, WhatsApp, Messenger, Slack and so on. Wunderlist is easily accessible from everywhere. As it is cloud-based you can manage all of your to-do lists through different devices. Adding the extension on Safari or Chrome browsers will allow you to add webpages for pending reads in existing or new lists (for which you can immediately add reminders). This way you won’t have to unnecessarily have multiple windows and tabs open, as you have easily save and organise them in lists. You can also and sync Wunderlist to your Outlook or Gmail and archive items, or create to-do lists for your inbox. With Wunderlist you can create a theatre list for all the plays you want to attend with your friends. But why stop there when you can add folders to categorise the plays by author or genre. 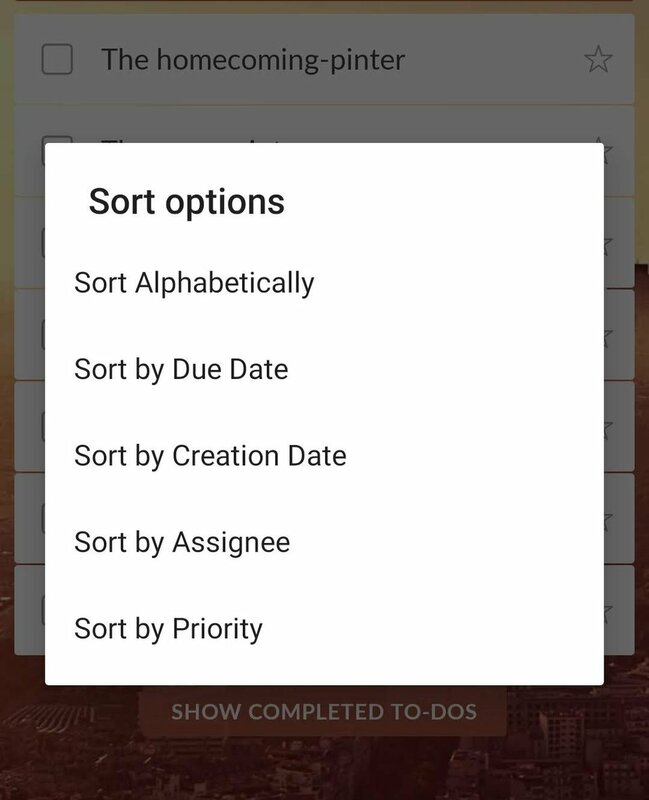 The created lists can easily be added to existing or new folders and they can cleverly be organised by due date, priority or alphabetical order. With the option to have repeating items and notifications there will be no excuse for getting out of that weekly salsa class or missing the yearly silverware cleaning (that’s right, once a year is enough). This is also a useful feature for office work so that you never miss your weekly brainstorming meeting or forget to plan a future project. You can add notifications through the edit dialogue of each list and receive these either via email or as push notifications. In case you’ve managed to finish this list without downloading Wunderlist already: it’s cost-free and ad-free. If you’re a big fan you can eventually upgrade to the premium version for $4.99 a month. Wunderlist for Business is also $4.99 a month/per user and it allows for a 30-day trial. The paid versions allow for unlimited assignments, files and subtasks. How do you usually manage your tasks? Let us know!